Is Metal Gear Solid V as big as David Bowie right now? The musical references of this year's most daunting commercial video game are resonating in surprising and brilliant ways. If you're even a little bit interested in video games, you can't help but have noticed the launch of Metal Gear Solid V. In many ways it is everything an Offworld game is not: costly, commercial, massive, daunting, and glittering with the ache of years. You've probably also heard it has a basically-naked woman in it, and if we're ever going to totally fix sexism we can't have that. Purse your lips and cross it off your list. Just kidding. I'm such a huge fan of this series, and MGSV is really stunning. And while the sense of humor and tone we chalk up to longtime director Hideo Kojima often take weird left turns into perviness, poop jokes and dorky, jarring cinephilia, that offbeat approach just as often creates elegant, wonderful surprises. 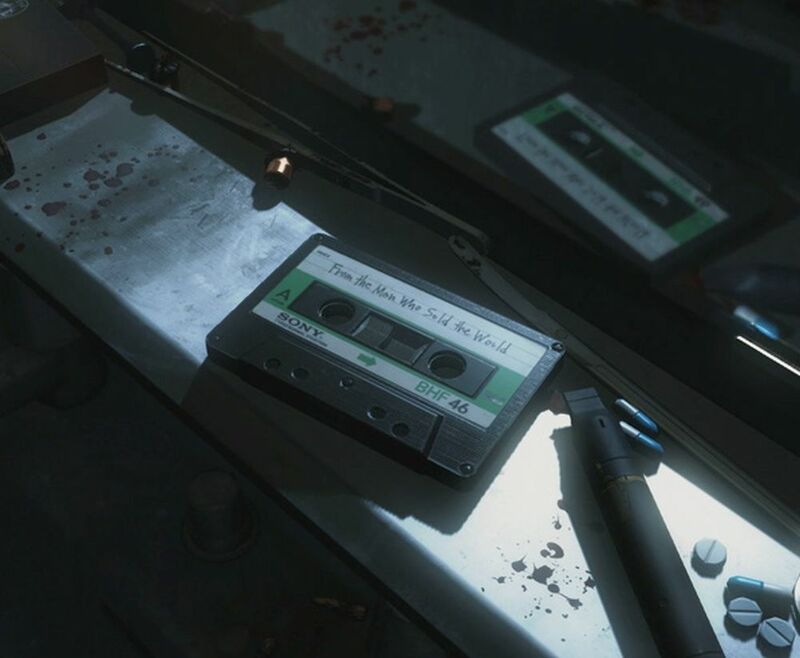 For example: MGSV, set in the '80s, is just full of the era's pop music. Give a medal to whomever had that idea. I'll be in the middle of infiltrating a base perfectly, and then I'll throw it all away because I hear "Take on Me" playing from somewhere and I've gotta go find and collect that tape so I can play it in my helicopter. You're galloping on horseback away from a hot zone of enemies and here comes your rescue chopper, and over the chaos and the whipping dust and the whine of the motor it offers you the subtle saxophone thread that introduces Hall & Oates' "Maneater." That's just what I set mine to; you can play whatever you want (I also like to put on Kim Wilde's "Kids in America"). In the game's beginning sequence, you wake up after a nine-year coma in some kind of military hospital to the sound of a cover of David Bowie's "The Man Who Sold the World". Although the song is lyrically apt (I must have died alone, a long long time ago), it's this Midge Ure version below, plonked out in synths, a jarring '80s take on a familiar 1970's song, which makes it an amazing thematic choice—you fell into a coma before synths were a mainstream thing, and you wake up to a synth cover, an alienating emblem of how time has passed, the world moved on without you. It's not the only Bowie reference in the game. The scrappy, stateless mercenary organization you lead is called Diamond Dogs—same title as the album which suggested Bowie's scrappy, stateless parachute away from the decline of ostentatious glam rock. 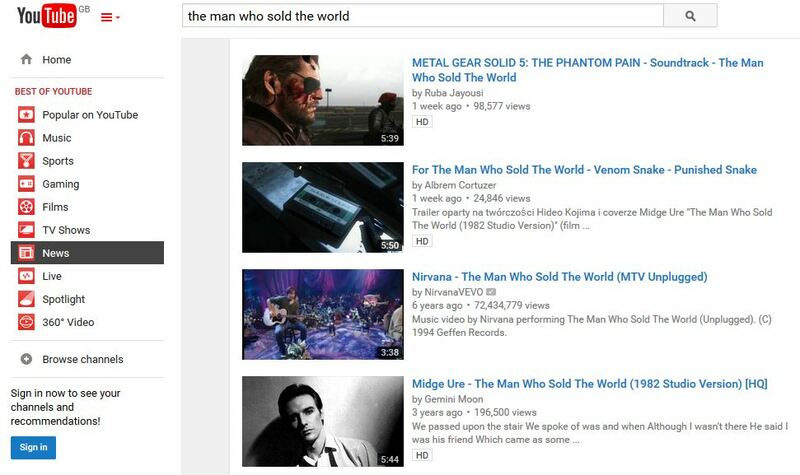 Interestingly, right now, if you type "The Man Who Sold The World" into YouTube, it's the Metal Gear Solid V soundtrack and Midge Ure's relatively little-known version that appears up top of the results—before Bowie's original, and even before the Nirvana Unplugged version, which, to be honest, probably formed an introduction to David Bowie for more of my generation than would be likely to admit it. It's amazing to think that a massive commercial video game could be providing new avenues for young people to discover music, and for people to think about what songs had to say about a time period. The numb synths and poppy excesses of the 1980s make wonderful background sound for a game about the ruthlessness of private military contracts and war.